Fitness trends come and go, but a heavy bag and pair of boxing gloves will never be outdated. Competition aside, boxing for health and fitness is undoubtedly one of the best things you can do for your body and mind. Boxing requires a certain degree of athleticism: speed, strength, agility, hand-eye coordination, endurance and more. Luckily, all of these things can be trained and mastered with a little time, effort and sweat. 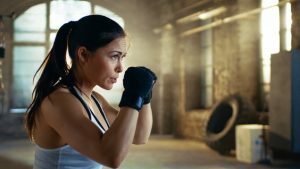 Fitness boxing provides a platform for anyone to hone those skills without having to take a punch and increasing number of gyms are offering classes specifically designed to promote health and well being through boxing. If you aren’t already convinced, here are 5 reasons you should give boxing a try. Running can get boring very quickly. It is also hard on your joints. Biking requires expensive equipment and maintenance. Swimming is hard to get motivated to do and all of these things are often solo activities. Though they are still good ways to get your heart rate up, these activities typically allow the mind to wander and dwell on the hardships of the day. Focus! The interval training that accompanies most boxing classes varies in intensity throughout the session. 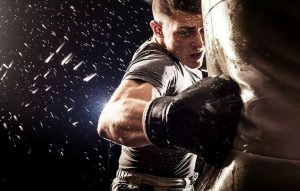 With fast-paced hands flying in specific combinations, the mind will not have time or energy to think about anything but throwing the next punch. Boxing provides amazing and stimulating cardio that will have your heart racing without having to put forth a conscious effort to work harder. How often do you see fluffy girls duking it out on HBO or Showtime? Not often if ever. Typically, boxers are fit and muscular. This isn’t from lifting weights. Most competition gloves for women are between 8 and 10 ounces. Training gloves are typically between 12 and 16 ounces. That is up to a pound on each arm, not to mention the squats and side-to-side lunges that come with boxing footwork. Core strength and composition will improve naturally even without all those crunches you will likely be doing in between rounds. The body has to stabilize through the core in order to throw effective punches, and the twisting motion that generates power in those punches is sure to tighten up your tummy. If you drift off in your own little world during yoga you may end up in child’s pose while everyone else is in downward dog. If you drift of during boxing you may get punched in the face. Well, not hard but even in cardio motivated classes it is common for coaches to keep students accountable with light reminder taps. Again, this isn’t running or weightlifting. Punching combinations require focus. Blocking punches requires focus. Boxing requires that you live in the moment, which is something many people find difficult to do and boxing makes possible. Everyone should know how to defend themselves. Boxing will not teach you how to disarm a gun or choke someone, but it will provide the confidence and kinesthetic awareness necessary to react appropriately in physically intimidating situations. Someone who trains in boxing will not only be more likely to defend a punch, but will have the proper footwork and sound mind to evade and remove themselves from a situation. Having both defensive and offensive natural reactions could make a big difference. According to the Mayo Clinic, almost any form of moderate to intense physical activity can decrease stress by increasing endorphins that boost mood and improve sleep. Boxing takes that to the next level adding a degree of adrenaline that is hard to find in other workouts. Frustration is a natural part of our everyday lives. What we choose to do about it determines how healthy our coping mechanism is. Are you going to find your vice in food, alcohol, retail therapy . . . or are you going to hit something? Not just hit something, but hit something really hard! The heavy bag can easily become your boss or your significant other. Let it out and go home with a smile on your face!